PhoneGap CloudRT makes it easy to protect and license your PhoneGap application for iOS or Android. 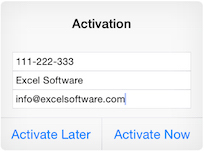 Add a Trial, Product or Subscription license to your application with Serial Number activation for each device. Add some files to your Xcode, Android Studio or Eclipse project and modify a few text strings to specify your license type and server. No programming is required to add the protection and licensing capabilities of CloudRT to any PhoneGap project. Use either the Safe Activation Service 3 or the Cloud License Server running on your own Windows or Linux website. A potential customer can enable a Trial to Product or Trial to Subscription license with their Email Address. Later the user can enter a purchased Serial Number to activate the full Product or Subscription license. An Internet connection is needed for initial activation. Once activated, an App can run without the Internet. Developers using CloudRT can request a free download of PhoneGap CloudRT.